This book had so many feeeeels in it that it's hard to decide exactly how I felt about it overall. So here I go. Jude (girl) and Noah (boy) are the exactly what twins should be. They finish each other sentences, literally feel each other's pain, have been in a rock, paper, scissors impasse for...ever, and just know what the other means when they make zero sense to the rest of the world. But growing up is hard and complicated. Especially when they're both dying for the attention and love of the one parent whose attention they don't have. For Jude, she sees that for her mother, the sun revolves around Noah and his amazing art. For Noah, he sees that for his father, Jude is everything that his father wants him to be, and everything that he cannot be. Jude and Noah take turns narrating chapters, except Noah's chapters take place when the twins are 13 going on 14, and Jude's chapters when they are 16. In-between in the ages of 13 and 16 there are so many stories, complications, misunderstandings, hurts, damages, and victories tangled up into a many faceted mystery that you are flipping pages as fast as you can to see what exactly is going on. What exactly happened to Noah and Jude that made them hate each other? 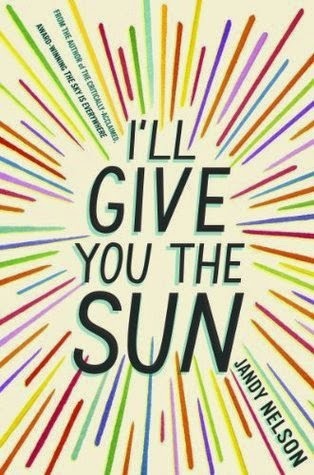 I'll Give You The Sun is written like it's narrated by your weirdest, quirkiest best friend. I loved how it was written. So. So. Much. This novel is very art centric, and it isn't even until now that I realize how vivid the art was in the book, without slogging through tedious details and explanations. I loved the character development throughout this book. I felt like I understood and knew almost each one by the time I closed the book. Also, the growth for each character was satisfying and felt natural. I got really choked up and even cried a little while reading this. I was also really disturbed, embarrassed, VERY angry, felt a little hate, a little swoony, and a lot of fierce loyalty. I think we covered all the feels bases. This book explores a lot of different issues, especially the frustrations, pains, scars, confusions and victories of sexuality, relationships, and love. I had a hard time with the ending and the kids relationship with their parents, their mother in particular. Why? Because I would not react the way they did. haha. And it took me awhile to think about what happened and accept that kind of thing happens all the time in real life. It happens to people and it happens to families. And after thinking about it, I felt like it could be a very realistic portrayal of a family put in those kinds of situations. The magic that happens in this book is not the fantastical kind. It's the magic of awesome, possibly meant to be, things happening in ordinary lives during ordinary moments that have accumulated together to make awesome things feel fated. It is also the magic of word craft. Brilliant word craft. I wish I could write down every awesome sentence that was in this book. I wish that we could talk about how clever all the blue barf that no one noticed was. “Or maybe a person is just made up of a lot of people,” I say. “Maybe we’re accumulating these new selves all the time.” Hauling them in as we make choices, good and bad, as we screw up, step up, lose our minds, find our minds, fall apart, fall in love, as we grieve, grow, retreat from the world, dive into the world, as we make things, as we break things. He grins. "Each new self standing on the last one's shoulders until we're these wobbly people poles? I die of delight. 'Yes, exactly! We're all just wobbly people poles." I chose Capri Sun (you can pick your favorite flavor) for this drink. Two reasons. 1. I drank a Capri Sun every day while I was in junior high AND high school. It feels so connected to the age of Noah and Jude in this story. 2. Mostly because of the word "Sun". You'll obviously need to read the book to understand its title, but a Capri Sun is the only Sun I'd be willing to give you. ha. You've convinced me to add this one to my "to read" list!